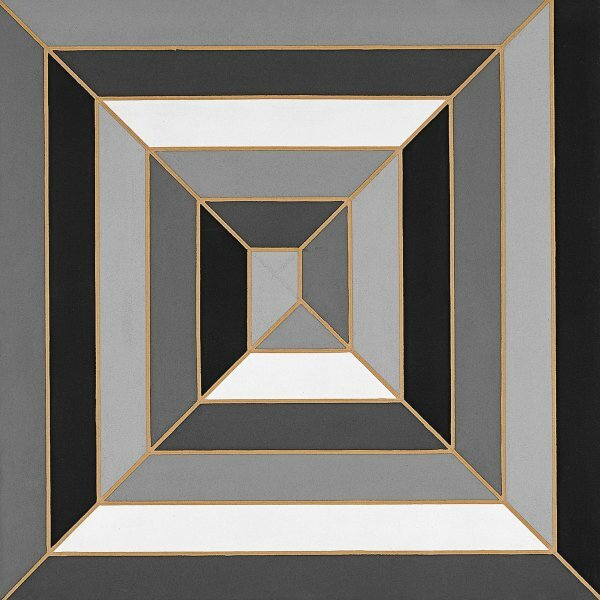 The American painter and sculptor Frank Stella belongs to a generation of artists who, despite spending their formative years in the abstract environment that emerged after the Second World War, reacted against the gesture and spirit of Abstract Expressionism by producing works governed by geometry, in which they completely negated spatial illusion and advocated the two-dimensionality of the canvas. Stella studied at the Phillips Academy in Andover and at Princeton University. In 1958 he visited Jasper Johns’s first exhibition of flag and target pictures, which interested him enormously, even though the brushwork came close to Abstract Expressionism. That year he settled in New York and his work soon began to attract the attention of critics, particularly his series of Black Paintings shown in the Sixteen Americans exhibition held in 1959 at the New York Museum of Modern Art, which acquired one of them. His subsequent series, Aluminium Paintings and Copper Paintings, went one step further in this direction and introduced another of the characteristic feature of his art, the use of an alternative format to traditional rectangular canvases. In 1959 Stella joined the large group of artists under the wing of Leo Castelli. Since then he has taken part in numerous exhibitions in which he has been hailed as one of the leading representatives of Minimalism, among them the early retrospective of his work staged by the MoMA in 1970. Since the 1960s he has extended his investigations to other fields of art. In the middle of the decade he began experimenting with engraving with Kenneth Tyler and in 1967 he designed the set and costumes for a dance piece by Merce Cunningham. In the following decade relief began to appear in his paintings, which became more exuberant and baroque. This marked the first step in his experiments with sculptures, which attained monumental dimensions in 1990.